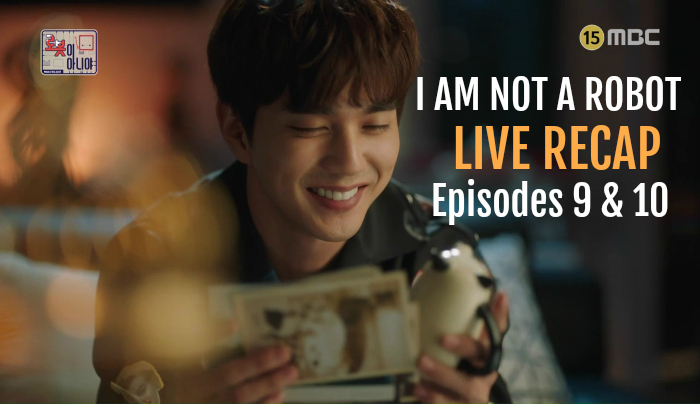 Here is the live recap for I am Not a Robot Episodes 9&10. Let’s see how this date out goes shall we? MG – I wish she is a robot like you, then I can touch her hair like this, hold hands like this, go out somewhere with a lot of people, and…*almost kissing* I will kiss her like this also. He steps back and doesn’t kiss her. MG – I see the answer when I touch you. My necklace, I will give my necklace, to the last woman of my life. He goes to his room and opens a little box with postcards and a cute ceramic animal inside. MG – she remembered my birthday, which is also my parents memorial day. The day no one will bless. The one who gave me a little joy. That’s enough. JA is walking he mansion grounds, perhaps to the building? Ah, yes, she is in the mansion now and is putting the letter from the applicants in all his mail. JA – this is my last chance, if it doesn’t work then I am really giving up. This man, what does he think of me? I look like a woman, but I am a robot. MG comes in, dressed well and on the phone. MG – Just empty the place, I don’t need someone to serve food. MG – AJ3 – look at the sky, the clouds are having fun. It is a good day to propose. JA – Are you proposing today? They see the almost kiss and of course, BG doesn’t like it and says to take JA out. But they say that they both aren’t there. MG and JA are talking about proposing. MG has had this mug for 15 years because RE is a special person to him. He tells JA to serve the food and to not make a mistake. Riel came and MG runs over to her. Meanwhile, BG is leaving the laboratory to find MG. He is following AJ3 GPS. He’s angry. Back at the dinner. MG made RE coco, but RE doesn’t like cocoa, it is too sweet. RE also doesn’t know what this mug is and calls this place childish. He reminds her that she gave it to him a long time ago, but she doesn’t remember. She said she will try to take some to be polite, but it is so sweet. JA is looking at this all the while. RE wants to know his answer and MG tells JA to bring some coffee. But RE wants an answer first. MG – Riel, I am with you, I am not going to have 3 dates, I am not going to kiss you. RE – So marry right away? RE – What should I tell my dad, that his pretty girl is dumped? He gives her the necklace. But she is wondering what that is. He says that it is a present as a friend. RE says they are friends but she puts the necklace back and slides it back over to him and says it isn’t a good gift. She stands up for a handshake and says to forget about their marriage and stuff. He doesn’t want to shake her hand, but he shakes her hand and starts to have his reaction. RE leaves and MG is having a really hard time with everything. He has the shot, but he doesn’t give it to himself. It looks like he might want to die because he just had his heart broken. MG goes to throw the necklace away and JA stops him. He tells her to go away because he wants to be alone. He doesn’t throw the necklace and sits down on the bench. It looks like his reaction is slowly healing itself maybe? No, his numbers are going up and it is starting to rain. JA brings the umbrella. It is her color changing umbrella. It is transparent now. He looks at her and they have a moment. He looks up at the rain falling and his numbers start to go down all of a sudden. JA and MG sit on the bench for a while. Then MG closes the umbrella and stands up. He gives JA his hand and says, “Let’s go home.” She takes it and they hold hands as they walk away. MG – That’s right, my friend, that’s my story. I dumped her. No, she dumped me. MG – It is because of you. I showed everything to you so it won’t embarrass me. JA – Then why are you holding my hand? MG hops, he thinks he is cured, he looks at his hand. He thinks it is strange…then he gets bumped by someone and that person holds him like he is a fallen angel. But his reaction doesn’t act up again. MG hops up. He thinks he shouldn’t be okay, but he is okay. He looks at the gardener. MG – Ajushi, can you touch me? Ajushi touch me!!!!! The ajushi runs away, lol. JA is wondering if the ajushi is the cure, and MG picks up the phone to call someone. Meanwhile, the scientist is driving to find them. There are so many people there, and MG is feeling so uncomfortable, but he is still doing it. A little kid hits him on accident and MG freaks, but realizes that he is okay. he is slowly starting to relax and buys JA a doll. But he doesn’t have any small bills. MG is shocked that he can walk around with everyone and touch everyone and nothing happens. He even gets a little fake tattoo art. The artist says that his girlfriend is pretty and he says she is not his girlfriend. But he thinks deeply about that. They go to listen to an outdoor performer and everyone holds hands. He jumps, but then he checks his watch and he is fine. he is all cured! he talks to doctor Oh on the phone and tells him to come to Korea. Dr. Oh says he can’t come back. MG tells Dr. Oh to not be surprised, but he is all cured, he can touch human beings! The doctor is not surprised. But then all of a sudden MG feels bad, he looks at his watch and his numbers are going up again. His arm starts to have a reaction. JA is looking for MG as she sits with the people. MG is still on the phone and he is saying that he thought he was all cured, but his reaction is starting again. The doctor tells him to use his medicine! he turns and sees AJ3, now his arm is getting better! But then AJ3 was out of sight momentarily and his reaction went back up again. But then he sees her through a cloud of bubbles and his reaction goes back down. The doctor wants to know if MG has anyone with him, and MG says someone is here. He tells the doctor about the reaction going away when he sees a person and going back up when he doesn’t. He is staring at AJ3 who is across the way. But he tells the doctor that it is not a human. He goes to AJ3 and their OST is playing. He slowly walks to her and hugs her. Everyone sees this and claps. MG – it was because of you because you were next to me. I will give you the longest lasting battery ever, until I die, forever, together with me. You are the most precious thing to me from now on. He gives her a kiss on the forehead and everyone cheers. But the doctor is there and is pissed! He walks up and punches him and tells him that he shouldn’t kiss her! he tells JA that he didn’t send her to do those kinds of things. They are both pulling JA and then JA says she is at 5% battery and is going to sleep mode, she turns herself off, lol! JA is pretending like she is sleeping. BG tells her that MG isn’t there and JA takes a deep breath, lol. Then they argue. She wants to know why he followed her and he wants to know why she is going place with him and all those things. JA takes a little nap and when they stop the car at a light BG looks over at her. It looks like he is still in love with her. He wonders what he has done. He takes JA to her house. He tells her that the test if over and her job has ended today. MG is walking around his house as a new man. He is so happy that he didn’t have any reaction. He is talking about it to his doctor and they both don’t know why. They are trying to figure it out together. The doctor asks him a lot of questions about the robot like how long he has had her in the house and what they have done together. He wants MG to remember everything that happened in the house since the robot came. Maybe they can figure out what happened. The brother came home, and JA sneak peeks them, but she can’t go home like that so she walks away. SHe goes to a jimjilbang. JA – JA, you did your best, your part-time job ended. All your fate is on the final. She lays back and sees a cute grandmother and her grandbaby and smiles. She thinks about the kissing on the forehead scene and smiles. But then she hops up. JA – Get real Jo Ji-ah. But everyone around her is kissing. So she goes into a cold room and meditates. She wonders what the meaning of that kiss was. Was she more like a little kid or a woman to him? Then the kissing couple goes into the room, lol. MG is remembering all the things that the robot has done with him like all the curse words she told him. he laughs and wonders if that was the miracle moment. Then he sees another spot where she hit his back and he spits out the medicine. Then she held his hand. Maybe that was the moment? he thinks about the cat mask moment while eating and says that she was really cute back then. But then he says that the cuteness didn’t’ bring the miracle. The doctor calls back and wonders if the doctor really looked like a human? Did he tell her his concerns? Did he talk about his disease to her? How does he feel if he doesn’t see the robot for 10 days? MG says he wants to see her so 10 days is too long. The doctor thinks MG built a friendship with the robot and maybe that is what miracle. MG thinks about all the friend moments he had with JA. He touches his heart. He thinks that JA has rooted on his heart. The detectives are following the scientists around. They think they have them. the scientists are wondering where BG is, and then he walks in. They watch the video and think that MG is a pervert and strange. But it looks like the girl scientist thinks all the boys are stupid. MG makes a cute sign for AJ3 that says it is his pretties room and he hangs it over a door. Then he thinks he sees her. She says he has to take care of his precious thing. he thinks that he shouldn’t have told her that and hits his head on the door. RE is talking to EC and they are talking about MG. She wonders how he can dump her. She is talking about how she is so perfect so how can he not like her? EC listens to her talk about all these things. But then MG calls. RE – You just dumped me to test me? Let’s see this weekend, I don’t like college things. She tells EC that she is sorry but they can have drinks later and she leaves. Then his underling comes in and they say that they found the robot and MG’s house. RE sees the proposal that JA made about the lamps and says that it looks good. They talk about MG and how he is a nice person. The friend is talking sense to her. But JA wants to go and see MG, she thinks of all these excuses to go, but her friend shuts down all these reasons. My bag is there! The letter! She is making up all kinds of excuses to go there. She gets a phone call and finds out that the program is open again. It looks like RE opened it back up because it is a good program. So now her friend tells her that she doesn’t have to go back to the house again because the program is open again. MG is all anxious that AJ3 isn’t coming back to the house. he has a conversation about this with BG at his outdoor table. BG says that he will reveal to the world that MG is a pervert that kissed AJ3. MG says that he had a reason! But BG just says something and leaves. The scientists have a meeting with someone. it looks like BG is trying to find someone to fund him, but the man says that his reputation is bad in the research community so no one will fund him. He leaves. JA is at the gate of the mansion, she wants to go in, but she isn’t. But then the butler picks her up and delivers her to the mansion door. One of the scientists sees JA3 sitting in the back of the truck and thinks they have trouble. JA sneaks into the house and MG sees her. He hugs her right away and says that she came! he is so happy that she snuck out to come to him! He tells her that she needs to study about him every day and input all his information otherwise he will not be happy. He asks how much battery she has and she says she has 8 hours if she is in power saving mode. She shouldn’t do any work so she can save her battery. He tells her to just sit down and be in friend mode. She wants to know why and he says that someone asks him what she is to him and he said that she was a betrayer that followed another guy, but he also thinks she is a friend that he hasn’t had for several years. he doesn’t want to be separated from her. He tells her that he has his own way to protect her and to not worry. Cut to his table outside and two of the scientists. It looks like he is giving them a lot of money. They freak out and accept it. But then the girl scientist says they don’t need the money and pushes it back. He gives them 3 more (like $1,000,000 per envelope). But she pushes it all back. Then he gives them all the envelopes they made and the secretary dumps his bag with all the envelopes. Only the girl scientist has her wits about her and says that they want the robot, not all this money. She pulls the other scientists away by the ear. The grounds person tries to tell them that they can have so many things if they relent. But Pi tells him no. MG is about to freak out because it is almost time for AJ3 to leave. He is wondering what he can do to convince the scientists. AJ tells him that all the money won’t work…he should cook for them. MG laughs and says he will not cook for them. Then JA says he will lose his precious thing without doing it. He relents and looks in his cabinet at all his Moms pretty dishes. he wants to use them because this is an important moment for him. He starts to cook but he has only cooked for himself, so he doesn’t know how much money to prepare for several people. JA wants to help him, but he tells her that her battery will run out so she should just rest. She asks why he is cooking so military like and aggressive. He says it is because this cooking is the only thing that can protect her. BG is pinning over JA. JA dresses like a pretty girl and the really dumb spies figure out that JA is not a robot.